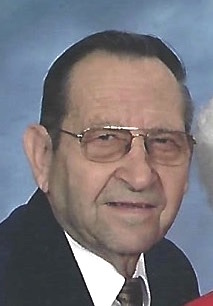 Gerald A. Gangloff, 95, of Metamora, IL passed away at 11:05 am on Saturday, March 23, 2019 at Snyder Village in Metamora. He was born on March 15, 1924 in Metamora, IL to Henry L. and Susan J. (Scheirer) Gangloff. He married Laurina C. Kiesewetter on September 18, 1947 at St. Mary of Lourdes Catholic Church in rural Metamora. She passed away on July 23, 1977. Gerald then married Alfredda B. (Hensley) Waldschmidt on September 23, 1983 at St. Mary’s Catholic Church in Metamora. She passed away on December 6, 2013. Surviving are children Doug (Kathy) Gangloff, Al (Kathy) Gangloff, Karen (Roy) Winnett, and Laure (Chuck) Heinzmann all of Metamora; step-daughter Kristi (Duane) Blumenshine of Washington; ten grandchildren; twenty great-grandchildren; three great-great-grandchildren; five step-grandchildren; and two step-great-grandchildren. He was preceded in death by son Paul, step-daughter Vicki, granddaughter Kara, two brothers, and one sister. Gerald was a life long farmer, a home construction contractor, and a life long member of St. Mary’s Catholic Church. He was the last living charter member of the Knights of Columbus Lady of Sorrows Council No. 3060 in Metamora and twice Grand Knight of the council. A Funeral Mass will be held at 10:00 am on Thursday, March 28, 2019 at St. Mary’s Catholic Church in Metamora with Father Vien Van Do officiating. Recitation of the Rosary will be held at 4:30 pm on Wednesday, March 27, 2019 at Mason Funeral Home Metamora Chapel with visitation to follow from 5:00 pm until 7:00 pm also at the funeral home. Burial will be in St. Mary’s Cemetery in Metamora. In lieu of flowers memorials may be given to St. Mary’s Catholic Church, 415 West Chatham Street, Metamora, IL 61548 or Snyder Village Resident in Need Fund, 1200 East Partridge Street, Metamora, IL 61548. Online condolences at www.masonfuneralhomes.com.